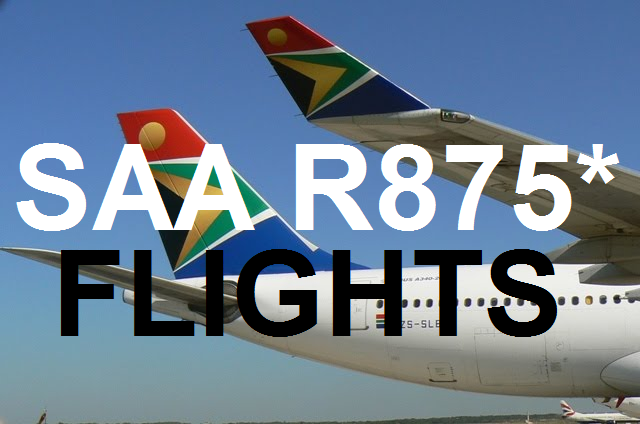 SAA R875* Special | Only TODAY! SAA is running a 24 hour sale with selected flights available for R875*! This great fare is only available today on selected flights from the 15th of July until the 31st of July 2015. The set fare is available on selected flights on the following domestic routes: Cape Town - Johannesburg*, Durban - Johannesburg*, Port Elizabeth - Johannesburg* and East London - Johannesburg (*and return). These fares can only be booked today, the 15th of July 2015, until 23h59 today or when availability runs out. So make that booking before it is too late! Click here to see all of SAA's latest specials here. The bottom line: "In the end we only regret the chances we didn't take!"